I am a firm believer in cake—in particular, everyday cake. I’ve always had a sweet tooth, so I’m sure I could have been compelled by the concept very early on. Yet I trace my allegiance to a time further down the line: those post-college years that were so formative for me, when I was working my first real job, living in an apartment all my own and learning how to live as an adult in the great big real world. It was a strange time, as I think that season is for everyone, yet perhaps particularly so for those of us who graduated smack in the middle of the recession. I sorted out the surprising challenges of just living over inexpensive bottles of red wine shared with friends, devoured food blogs on my lunch break and spent most of my free hours in the kitchen or on long runs around my city. My day job was frustrating but terrifically formative. Come 5pm, though, I was free. I would go to yoga or run a few errands, then go home to a space that was all mine. I remember making the same gingery garbanzo bean and arugula dish in my kitchen night after night, reveling in the rather new experience of creating something delicious all by myself for my own enjoyment, while streaming NPR broadcasts from the day. On the weekends, I went to the farmer’s market, established my regular haunts and identified all of the best pastries in town. When Monday rolled back around, I ate my morning oatmeal in my tiny kitchen with its bright orange walls, leaning up against the little hutch that held my then-small collection of cookbooks and treasured glass bowls from Spain. I learned what it felt like to have a routine. I met amazing people. I discovered fancy cheese. I slogged through cold winters. I struggled to get out of bed in the morning to do it all again. There’s a particular part of myself that I found during that season. As strange and trying as those years might have been, I can’t help but think fondly of them. When I go back to the blog I kept at that time, I typically end up in tears. I remember so vividly what I felt, as I built my life and grasped for truth and experienced the grandness and strangeness and horror and mystery of living. [Life] has been a very bad match for those of us who were born extremely sensitive. It is so hard and weird that we wonder if we are being punked. And it is filled with heartbreaking sweetness and beauty, floods and babies and acne and Mozart, all swirled together. I’ve become both wiser and more anxious with each passing year. The longer we live, I’m realizing now, the more attached we become to the people around us, our communities, this crazy wild beautiful world we’re living in. Getting married really did me in. I thought I understood what it meant to be attached to someone, but I didn’t; I didn’t have a clue. I’m all wrapped up in Ben’s life, and he in mine. I know I’m still the strong adult human being I was before, but I’m also pretty dang attached. And we’re so incredibly fragile. My heart has been broken watching tragedy unfold out of nowhere, both in the lives of people I love and in far away places I’ve never been. I hate it when Ben steps on an airplane without me. It’s wild that we would dare to love each other at all. Yes, Anne Lamott. I do. I do feel like I’m being punked. Yet. Here I am. What is a person to do, but to live and love as best she can, to revel in that which is beautiful, to dance without inhibition, to chase after the things that make her blood run, to remind herself over and over again that all shall be well and all shall be well and all manner of things shall be well? Which brings us to everyday cake. 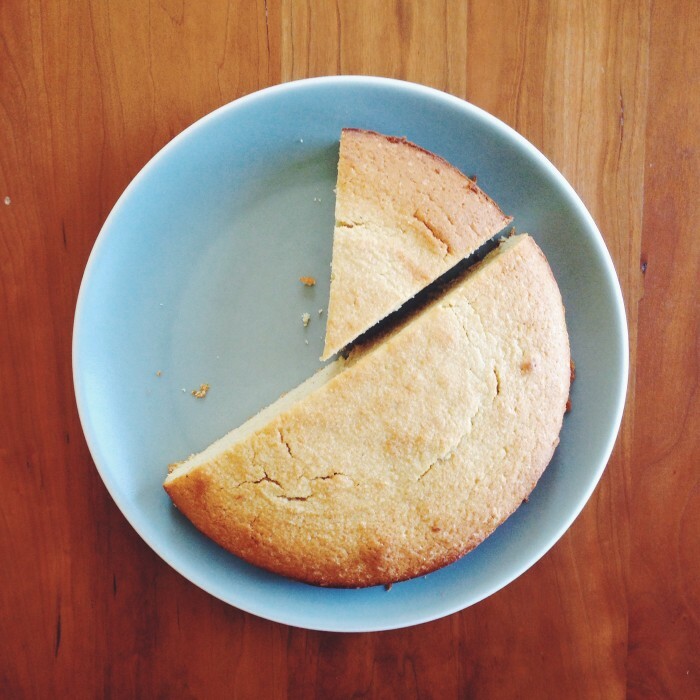 It was during those aforementioned formative years that I discovered Molly Wizenberg’s blog, Orangette, and with it her rendition of Edna Lewis’ everyday cake. I also found Deb’s Blueberry Boy Bait, and a whole slew of everyday cakes in her archives. Melissa Clark calls it snacking cake, another perfectly acceptable name. 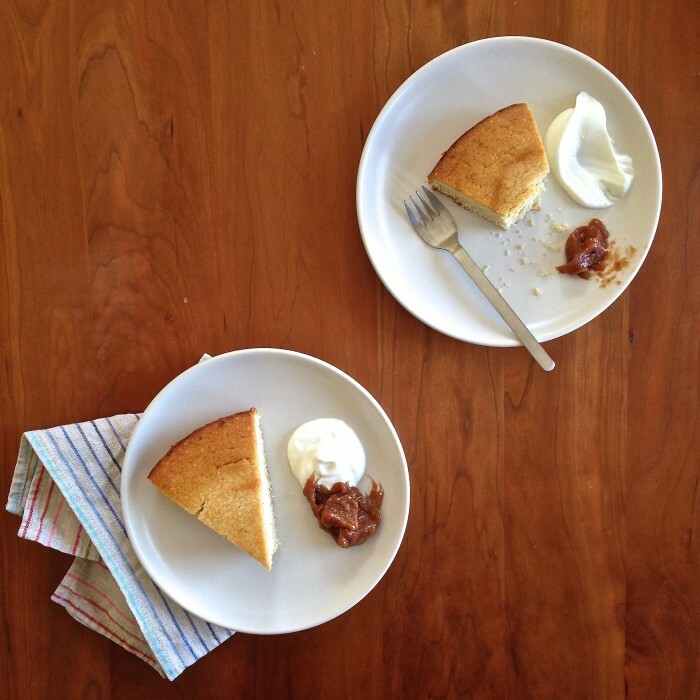 You may be familiar with French yogurt cake, which falls into the category, and there’s a whole subset that involves crumb toppings, as well as a slightly distant cousin characterized by fruit and caramelization and flipping. Shape matters not; throw the same batter into a loaf pan for something you could just as accurately call quick bread. I’d had no idea that everyday cake was a thing! I had never been all that into cake—or, more accurately, I’d never been into the overly sweet, dense, buttercream-topped cake we’re accustomed to eating at weddings—but this was right up my alley. I’d bake up a cake over the weekend, then take thick slabs to work for late morning snacks and slice off thin pieces late at night, one after another, dancing around my very own kitchen, putting off the task of going to bed. The cake would last me the week, perhaps with some stashed in the freezer for a later date. And then a new recipe would catch my eye, or some new produce would hit the market stalls, and I’d begin again. As I was learning and continue to learn, life is hard and complicated and weird and wonderful. And that’s okay. And this right here is the sort of thing that gets us through. I posted this on the blog I kept for a few years after college, the one that led to the birth of Delightful Crumb, but it seems high time for a revival. Considering the degree to which I adore this recipe, it feels essential to have record of it here. This is the simplest and best cake I know. The cake bakes up with a slightly crisp top and perfect crumb (delightful, dare I say?). I love it most when consumed in the late morning or early afternoon, paired with a steaming mug of coffee or tea. But it’s also wonderful for dessert—with ice cream, whipped cream or honeyed yogurt and a dollop of compote or slices of fresh fruit if that’s what strikes your fancy. Speaking of embellishments, you can also toss a handful of fruit into the batter at the last minute with great results. Preheat the oven to 375 degrees. Butter a 9-inch springform pan. In the bowl of a stand mixer or with an electric mixer in a large bowl, blend the butter and sugar until light and fluffy. One by one, add the eggs, beating well after each addition. Add the vanilla and beat to blend. In a medium bowl, whisk together the flour(s), baking powder, salt and nutmeg. Add about 1/4 of the flour mixture to the butter mixture and beat on low to incorporate. Add 1/3 of the yogurt and beat again. Add the remaining dry mixture in three more doses, alternating each time with a bit of yogurt and beating just to combine. With a rubber spatula, scrape down the sides of the bowl and stir to incorporate any flour not yet absorbed. Scrape the batter into the prepared pan and spread it evenly across the top. Bake for about 35 minutes, or until a toothpick inserted in the center comes out clean. (Check the cake after 20 minutes. If it’s browning too quickly, tent with aluminum foil.) Cool in the pan for about 20 minutes, then remove the sides of the pan and continue to cool. Serve at room temperature, or slightly warm. The cake will keep for several days, wrapped tightly in plastic. Looks good, I’m definitely going to try it out! The yogurt measurement — I’m assuming 1/2 cup? Is that correct? Yes! Just updated it to reflect that. (: I hope you enjoy! So many good reminders & lessons here, and I love hearing your perspective on things. Thanks for sharing. I’ll have to try the cake with my usual substitutes & see how it goes! I so enjoy your blogs, Stacy! Thank you for the everyday cake. I used to make a cake out of The Cake Doctor every week when my kids were young. My husband and I worked full time and were always pressed for time, so using those “recipes” made me feel like I was making something more than a box mix cake. LOL! I’m thankful I have more time to be more intentional in my cooking/baking these days, and I’m going to try your recipe with some blueberries and a bit of orange peel. I enjoyed a BLESSED morning with your mom. She served banana bread prepared by the Uganda method your sister teaches. YUM! We heard about your parents’ trip and saw many beautiful photos. She also filled us in on your journey into food blogging. We drooled over Vibrant Food! Can’t wait to get that. BTW- do you have a recipe for your gingery garbanzo bean and arugula dish? Just threw mine in the oven, using a generous handful of blueberries. I used to make a cake every week when my boys were young but I used mostly Cake Doctor ‘recipes’. My husband and I worked full time & I thought making cakes from box mixes was the best we could do. It’s so nice have time for healthier baking/cooking. Thanks for your reflections, Stacy. Beautifully written. I enjoyed a morning with your mom hearing all about their trip & traveling along through her photos. The steamed banana cake was better than expected, but it made me thankful for our western ovens.